With two co-op visits in Jacaltenango, I learned a lot during my time there. It was also interesting to spend a few days in the small town and experience the way of life there. Guaya’b and Rio Azul are quite different co-ops. Guaya’b is larger and has been established for longer than Rio Azul. Honey is also a significant contributor to the co-op’s revenue. Rio Azul faces challenges that are typical of smaller co-ops, such as high costs and obtaining sufficient investment, but they have grown over the years (when others I’ve visited remain fairly steady in membership numbers). They are playing a bit of ‘catchup’, but realise the need to make investments in their warehouse, security and office facilities. There are also many other coffee organisations in the region of Huehuetenango and it is a prized area for coffee production for both domestic and export markets. My visits to the coffee parcels demonstrated the amount of work required and how difficult they are to maintain, particularly to keep to organic standards. At the front end of coffee production it’s an arduous life and the rewards are few. The farmers I saw are at least able to maintain their own plots and being within the co-operative does give each farmer some collective support and access to resources that they otherwise wouldn’t have. Seeing Lucas give presentations to the farmers was also very interesting. 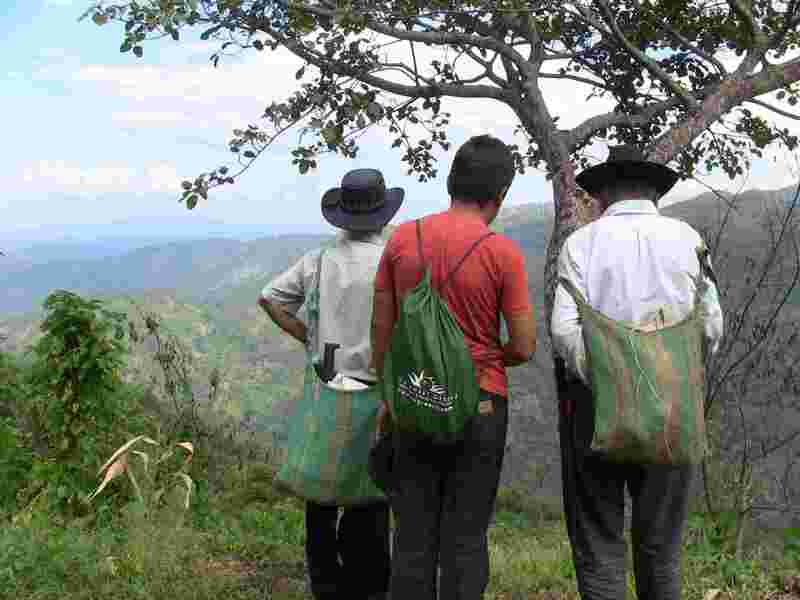 It is a requirement of Fair Trade that the farmers are given information on the performance of the co-op. In his presentations, Lucas outlined the importers who made purchases, when, the quantities and the value. This was broken down for organic and conventional coffee. Costs and income was shown on a series of slides. 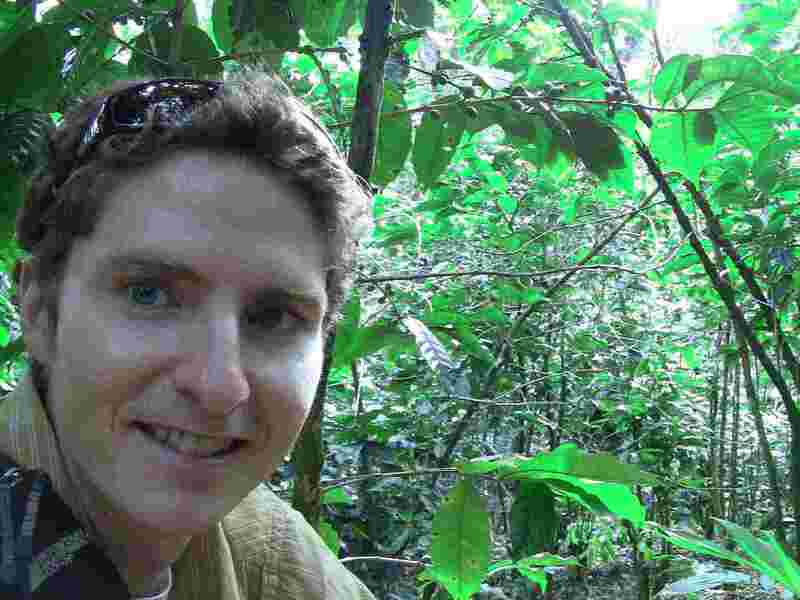 I attended a 2nd presentation with Lucas in a nearby village, where Lucas presented using the indigenous language Popti’. I thought it quite funny when Lucas stopped midway through to check his Blackberry for the latest coffee prices to show the farmers. Both Lucas from Guaya’b and Ramon from Rio Azul were incredibly helpful during my visit, ensuring I got a good insight into their co-ops. I’m still amazed by how friendly and open the people are when I show up on their doorstep asking to see some of their co-operative! Aside from my time with the co-ops, I got to see a little of the town itself. There is certainly not much ‘to do’ in the town, so I had to adapt to the pace there and ‘slow down’ a little. No tourist cafes, sights to see or big hikes in the hills…I found myself wandering the streets a lot, checking the market stalls (some of which seem to exist more in hope than expectation). The quiet atmosphere of the town seemed only to be interrupted at night by the yapping of the local dogs. At least it made a change from nightclub music. 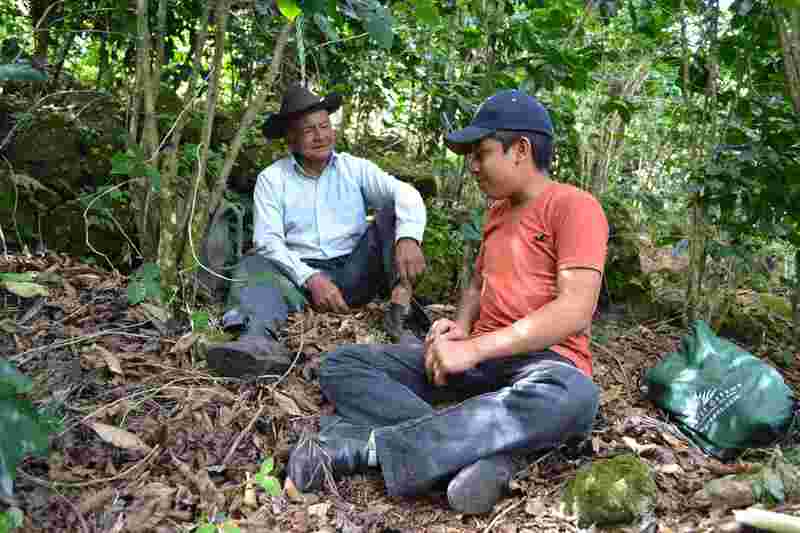 My time with Guaya’b and Rio Azul in Jacaltenango included visits to their coffee parcels. These were my first proper visits to see Fair Trade coffee areas and it was a fascinating insight. 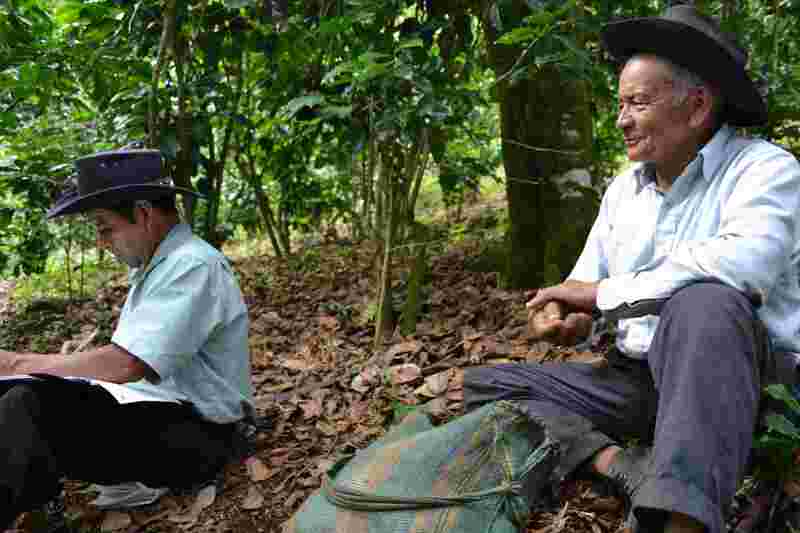 WIth Rio Azul, I accompanied Manuel and a farmer, Don Juan, to inspect Don Juan’s son’s coffee plot. About a 45-minute walk from the town, we left the dirt road and meandered through plots of corn to get to the coffee. Each plot is barely demarcated from another; typically by a dilapidated barbed wire fence. Don Juan’s son’s (Antonio’s) plot is typical of the size of many family-owned plots, around 1-2 hectares. To the untrained eye (i.e. me) it was hard to notice all the coffee bushes amongst the other growth of trees and bushes. However, gradually through the morning I got to learn about a typical plot and what goes into making a productive plot. The bushes are planted in rows at regularly spaced intervals about 2m apart. Sometimes it is difficult to notice it because of the sloping terrain of the plots. The way the plot is looked after and cultivated is driven more by organic standards than Fair Trade. For organic certification, no chemicals or fertilisers are used. Compost is added to the soil behind each bush, by digging what I would just call a ‘flat spot’. Such is the terrain of many coffee plots this is an arduous and time-consuming process. Doing this gives the bush the right sort of nutrients it needs and also protects it from runoff and erosion that can easily occur on these steep slopes. Manuel uses an extensive checklist when conducting the inspection. This is a standard checklist (I saw the same ones when with Guaya’b) and we conducted a check of the soil, the bushes and the surrounding plots. For organic certification it is necessary to check on surrounding plots, particularly if they are conventional, because possible runoff from chemical inputs used in those can contaminate the organic plot. Manuel checks the state of the soil, other bushes and trees that are in the plot, any ‘barriers’ that help stabilise the terrain and several other things. We often hear of ‘shade-grown’ coffee and no doubt most people feel ‘good’ when they know they know they are drinking shade-grown coffee. The reality, of course, is more complex and just because there are other trees within a coffee plot doesn’t necessarily make that a good thing. The type of trees and bushes in a plot can help or hinder the fertiliy of the soil. The same goes for ‘bird-friendly’ vegetation. We spent a good couple of hours within and around neighbouring plots. Don Juan told me he’d been a coffee farmer for most of his life and he had a very pleasant, upbeat demeanour. He is one of those people who you could tell had a happy outlook on life. I asked him about what life was like in previous years but he didn’t give me much indication that he’d had big struggles when coffee prices were lower. 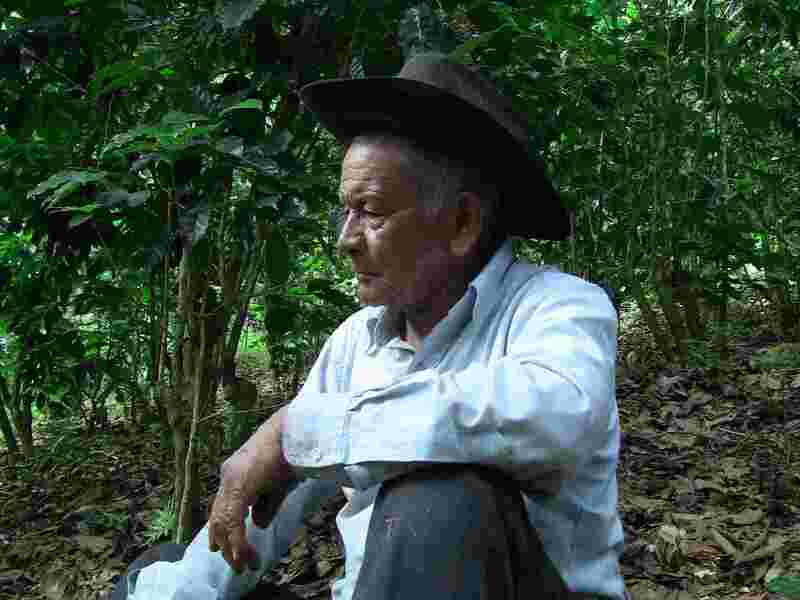 After that Manuel took to see a conventional coffee plot within the Rio Azul co-operative. It is certified Fair Trade but not organic. I could immediately see obvious differences but that could have been partly down to location. Manuel showed me the difference in the soil and where fertiliser inputs are used for each bush. A little fertiliser is needed, but Manuel can easily tell the difference between the two methods of farming. The farmer, Jose, tends the plot by himself. His two sons have moved away, so it would impossible for him to tend the plot to organic standards, given the extra work involved. 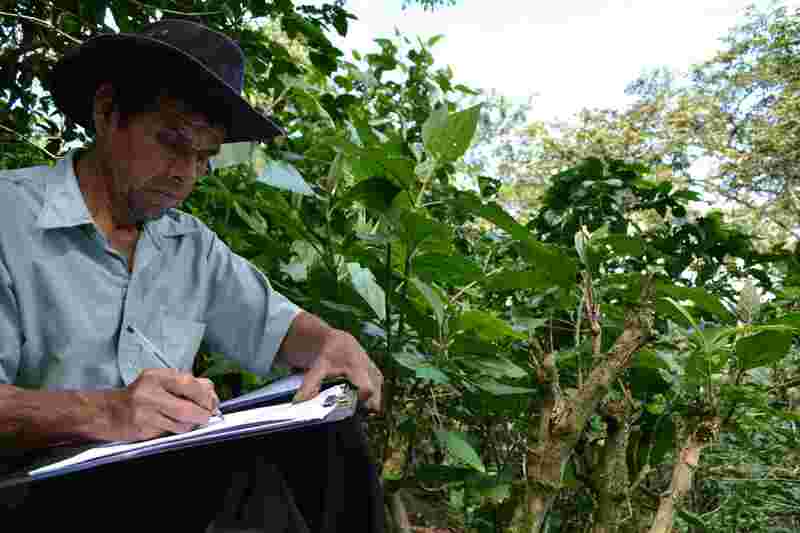 After more than 35 years as a coffee farmer, the additional money he would receive does not offset investing in the extra work involved. It was obvious that this is hard, hard work. A third plot Manuel took me to was a ‘transitional’ plot. If a farmer wants to switch from conventional to organic, it means undergoing a three year ‘transition’ process. This time required is necessary for the soil to recover from artificial inputs that are forbidden from certified organic coffee. This particular plot was in the 2nd year of transition and of the three plots I saw this day it was the one on the most steeply-sloping ground. The farmer here had already started to create the ‘flat spots’ behind each bush and I shook my head at what obviously looked like the incredible amount of hard work involved. Organic certification also requires more ‘weeding’ of the parcel. One real problem for the farmers is that during this transition process they do not receive additional income, despite the additional work involved. They only receive ‘conventional’ prices. Given that these standards are demanded from a ‘developed world’ perspective, there should be some way of assisting farmers in this process, if this is what we, as consumers, are demanding of our coffee. Later I asked Ramon about conventional vs organic farming within the co-operative but he says this kind of situation (at Rio Azul) is typical. Although organic farming is encouraged, he is realistic enough to know that many farmers will not switch to certified organic methods. However, Fair Trade standards do mandate against the use of certain chemicals and fertilisers and there are certain ‘environmental’ practices that are required for Fair Trade certification. At the far end of coffee production, particularly with Fair Trade products, we see the happy, smiling faces of the farmers on the back of the packaging and that makes us ‘feel good’. Whilst Fair Trade does help, it often masks the massive amount of work that goes into food production, and my visits here made it obvious how we take it all for granted. The following day at Guaya’b an annual inspection took place conducted by BSC-Oko Garantie, a German organic certifier. Three inspectors arrived and with two of them we conducted some inspections. I accompanied Miriam to check the coffee plots along with two of the Guaya’b staff. There are many organisations that conduct organic certifications. BCS-Oko conducts inspections on a range of food products, particularly bananas, pineapple and cocao. For our inspection, we checked a number of different plots. Beforehand, Miriam from BCS-Oko talked with Guaya’b staff and checked the internal inspection notes of many plots to decide which ones to visit. She checked over some statistics for the co-op, such as size of the organic areas, total volume of organic exports (also any transition areas) and which areas cater specifically for North America or Europe. For the inspections, anything that might be a concern or require a check was noted. Internal inspections are conducted at least once per year, but it is impossible for an external inspection to visit every plot, so it is only those that Miriam deems of possible concern that are inspected. Miriam told me of some of the things BCS-Oko look out for. The typical concerns are the location of the coffee plot relative to other conventional plots. At one plot a drainage channel was under construction that would take any potential chemical runoff from a neighbouring conventional plot away from the organic one. Also we checked the soil of the plots to get an idea of its fertility and/or evidence of chemical input. Leaf rust (royo) can detrimentally affect the coffee bushes as well, so evidence of this is noted. The co-op pays for the inspection and the cost depends on what is required and the size of the areas to be inspected. Inevitably, the inspection costs are absorbed by the farmers themselves. It’s obviously difficult to inspect in detail these plots but I was a little surprised at how brief some of the inspections were. My guess is that on some plots Miriam was looking only for specific things noted from the internal inspections. I didn’t get a chance to ask Miriam if there was any cause for concern with the plots but I didn’t detect anything she was particularly concerned about. It was interesting to get an insight into how the process works, but it was clear from my experience the previous day that the internal inspections are conducted in more detail than these organic ones. It’s clear that retaining organic certification is important, particularly for the farmers. The amount of work they have to put in to obtain (and retain) organic certification is significant, but certainly for some it is not worth the extra effort, or they do not have the means to do so. More and more Fair Trade coffee is certified organic as well, and the quality is certainly higher, but I think sometimes we in the developed world get a little too carried away with demanding ‘labels’ on products without giving due consideration to the demands this places on the farmers themselves. The other co-op I visited in Jacaltenango was Rio Azul. This is a smaller operation than Guaya’b, comprising just over 200 members. Approximately 20% are women. Like Guaya’b it is 100% Fair Trade with both organic (about 85%) and conventional coffee. They produce only coffee and it is all exported to North America and Europe. In some cases, Fair Trade co-operatives cannot sell all their Fair Trade (a discussion for another time!) but Rio Azul typically does export all of their coffee at Fair Trade prices. Like most of my other visits, I just turned up but was welcomed by Ramon, the manager, and Manuel, who conducts quality control (there are only five employees altogether). Ramon and I quickly got into a discussion about the recent changes at Fair Trade USA (its proposed split from FLO, the international Fair Trade umbrella organisation) and Fair Trade licencing fees. Rio Azul are FLO-certified and when I mentioned IMO (another Fair Trade certification organisation) he did not appear to know much about them. The discussion about FT USA could keep me here for several days, but the sense is that Ramon is concerned about it, particularly with respect to allowing coffee plantations to be certified Fair Trade (currently the system in coffee is only for co-operatives). Because Rio Azul are a small co-operative, their licencing fees make up a higher percentage of their total costs. Ramon then showed me around the facility. Currently there’s a huge construction project going on here, with a new warehouse, office and security fence underway. So it didn’t look at it’s best but when finished (before the harvest starts in January) I’m sure it’ll be cracking. I got to see the progress anyway, and the big thing that Ramon kept repeating was ‘costa‘. All these projects are costly for the co-op, but clearly are necessary for their future. In the last five years their membership has increased by 25% (which is unusual for the places I’ve visited) so they need modern infrastructure in order to grow. It’s still a little before the harvest (typically from December-April) so I didn’t get to see the facility in full operation, but Ramon gave me a good sense of what happens at harvest time: coffee delivery (whole cherries), separation (organic or conventional), depulping, washing, drying, processing the pergamino (shell) to the final green (oro) coffee for export. Hopefully within the next few weeks I’ll be visiting a coffee co-op during harvest time. It’s normally a quiet time before harvest with all the construction going on it was busy…in a Guatemalan way. Not far across the border in Guatemala is the remote town of Jacaltenango. I hoped I’d be able to visit two co-operatives there, and as it was ‘only’ 50 km off my main route I gambled on getting lucky when I arrived. Yes it was only 50 km, but the uphill climbs more than made up for the short distance. I had a little time in the town at the weekend to track down the Guaya’b office and then I dropped by on Monday morning to see what I could find. I ended up spending six days in the town as I felt I got very lucky with both co-operatives.Jacaltenango is a small, remote town up in the highlands. It is perched high above the Rio Azul with a number of smaller communities dotted around the surrounding hillsides at various degrees of precariousness. 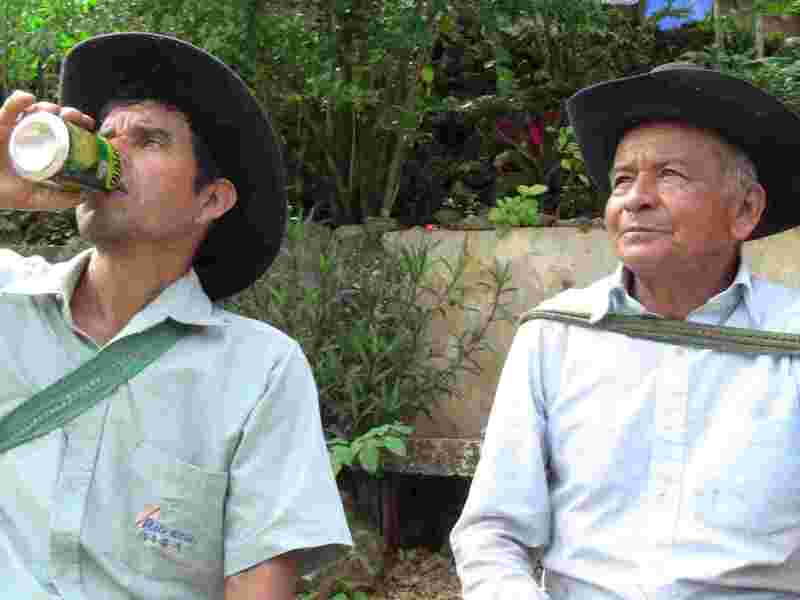 Guaya’b is a coffee and honey co-operative comprising more than 400 members. It produces 100% Fair Trade products though its coffee is both conventional and organic. They have organic (US & European), Fair Trade (FLO-Cert) and “bird-friendly” (Smithsonian) certifications. Mayacert are a national organic certification body but Guaya’b export all their coffee. Most of the members are indigenous Popti’ with the rest mestizos. Guaya’b exports all its products to Europe and North America. In organic coffee, the European and North American coffee are kept separate. All coffee exported is ‘oro’ (green) beans. Conventional coffee predominantly finds its way to Spain. The honey is produced primarily for markets in Austria, Germany and Belgium. Lucas Silvestre is the President/Manager and he was very happy to let me get an insight into the Guaya’b operations. Manuel, who oversees quality control, took me to the bodega (warehouse) where I was able to see coffee and honey processing operations and one of the Guaya’b coffee nurseries. Guaya’b have invested quite a significant amount into their operations in recent years and have received financial help from outside, including Oxfam Spain. The investment was obvious in the new bodega and honey processing buildings; both looked modern and well-equipped for their needs. Another major investment in progress is a ‘coffee drier’ – I don’t know the technical name but it is a huge machine that enables the coop to dry the coffee at harvest time on days when the rain comes down. It’s quicker than drying in the sun but obviously a lot more expensive. In quality terms it is very similar. Back at the office Lucas had invited a number of productores to a meeting/presentation to get an update of the FLO standards and get information on the 2011 harvest (typically the harvest is completed by May/June). Around 15 producers turned up (all men) and we squeezed ourselves into plastic chairs in a little room where Lucas then did some nifty improvisation to get the projector balanced and firing up against the wall. It is always interesting to see what sort of facilities each co-op has that I visit. Guaya’b have up to date computers and projector, a nice office and a really interesting minature coffee roaster that is kept in the social room. It looks like many typical large roasting machines but is small enough to fit on a tabletop! Lucas then presented a whole range of information for the producers. Firstly a review of changes to FLO Fair Trade standards that commenced in April 2011 (such as minimum price and organic price increases) and then an overview of the income and costs for the co-op in the previous harvest. Organic coffee is the highest earner, with conventional coffee and honey contributing lesser but significant amounts. Most of the discussion with the farmers seemed to be about how to make sure that organic standards are maintained. I picked up on quite a debate about the use of ‘honey water’ that is required at harvest time when washing the coffee. As is typical in these parts, the meeting started late and probably carried on later than anticipated too, so some refreshment (fizzy pop of course) was well in order part way through. At meeting’s end a few of the farmers got to pick up a payment. Perhaps that’s why the turnout was good! In Fair Trade, income is typically spread out at intervals through the year, rather than conventional farming when the farmers only get paid at harvest time.